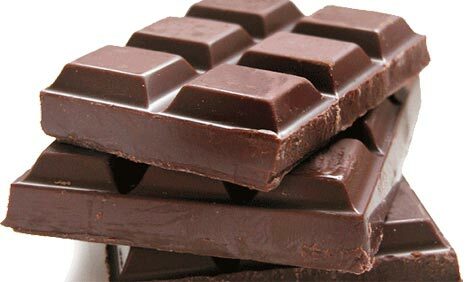 A study adds to previous research that suggestseating dark chocolate can make your eyesight and brain sharper. You may have already heard that dark chocolate can lower your blood pressure and also appears to have a favorable effect on cholesterol levels, platelet function and insulin sensitivity. The authors of the latest study, from England's University of Reading, enrolled 30 men and women ages 18 to 25 and tested their vision and thinking skills a couple of hours after they ate a regular-sized chocolate bar, a health website reported.They took the tests twice, once after eating a dark chocolate bar, and once after eating a white chocolate bar. The difference between the two chocolate bars was the amount of flavanols -- a natural compound in cocoa --they contained. Of course, the dark chocolate bar contained loads of cocoa flavanols, the white chocolate bar only a trace. Flavanols, found in high levels in grapes, green and black teas, red wine and applies as well as cocoa, have been getting a lot of good press lately as scientists study their health benefits. To avoid skewing their results, the researchers fudged when they told their subjects the purpose of the study: If the volunteers knew the focus was on cocoa flavanols, they might do better after eating the dark chocolate because they figured they were supposed to. Instead, study participants thought the researchers were investigating the impact of different kinds of fats. Turns out the study participants did perform better on the vision tests and on some of the brain function tests after eating the dark chocolate, the authors report in the June issue of Physiology & Behavior. They attribute their findings to cocoa flavanol's known ability to increase blood flow to the brain, and they speculate that the stuff might also increase blood flow to the retina of the eye. The good news is that other research suggests cocoa flavanol's positive impact on blood flow is even greater in us folks over age 25. So the Reading researchers are conducting a similar study in older volunteers. This time they'll add caffeine and theobromine to the white chocolate bars to make sure those stimulants from the cacao plant aren't the real reason for dark chocolate's brain and vision benefits.